After a brutal three set tussle with fellow American Christina McHale two days ago, Serena Williams was probably looking forward to a routine third round match at the Miami Open against Zarina Diyas ranked 97th. Yet, this encounter was anything, but. The world number had to claw her way to a 7-5, 6-3 victory. On the heels of Rafael Nadal retiring because of the insufferable heat to Damir Dzumhur world number 94th from Bosnia, the air seemed to have been sucked out of the stadium. However, when Williams broke to open the proceedings, there was a sense that perhaps order would be restored swiftly. Yet, her 22 year old opponent from Kazakhstan would not be docile. A few fist pumps followed a comeback from 15-40 to deuce. Soon after, Diyas leveled the set at 1 game a piece. There was no apparent hangover from their only prior meeting at Indian Wells in 2015, when Williams dismantled her 6-2, 6-0. As a reminder though, Williams quickly broke at love the third game and consolidated for a 3-1 advantage. Still the young Kazakh refused to fold. After holding serve at love for 4-5, Diyas manufactured a break point by forcing three successive miscues from Williams. By pushing her counterpart into a backhand mistake, Diyas equalized the set at 5 all. Ultimately, Williams shifted gears to regain the control promptly and on her second try closed out the the set. 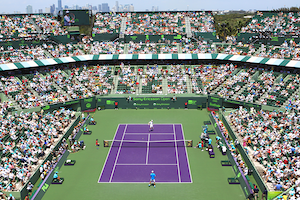 On a roll with six straight games, it seemed that the eight time Miami Open champion would cruise to victory. Once more, Diyas was not through. As Williams serve deserted her and the errors piled on, Diyas secured three successive games to reduce the deficit to a sole break 3-4. The eighth game Williams stood fast to guard serve for 5-3. Later, with Diyas dumping a forehand into the net, the American was at double match point. As Diyas’ backhand misfired, relief was evident on Williams’ part as she punched her ticket into the round of 16. Today’s triumph represents Williams’ 750th career match win. Despite, consecutive finals losses, the Australian Open and Indian Wells, something that Williams has not experienced in over a decade. She will surely surpass Lindsay Davenport’s 753 mark which is seventh best all time. Nothing like being at home, Williams has been dominant at this venue with a 74 wins and 7 losses. Moreover, Williams has not been ousted prior to the round of 16 since 2000 when she tasted defeat at the hand of Jennifer Capriati. Consequently, Monday’s match will be quite compelling as the top ranked player looks to reboot her 2016 season by continuing her quest for a ninth Miami Open title. Maria Sharapova is pictured as a rhythmic gymnast, Roger Federer as a fencer, Rafael Nadal as a soccer player, and Novak Djokovic as a skier. Among the believable portrayals are the towering duo of Ivan Ljubicic and Mario Ancic as water polo players, the ever so flexible Jelena Jankovic as a gymnast, and Lindsay Davenport as a volleyball player. Davenport’s father was actually a 1968 Olympian in volleyball. Portrayals that seem like a stretch include Serena Williams as a figure skater, Tomas Berdych as a boxer, and Nicole Vaidisova as an ice hockey player. To view the above pictures as well as all the others click here. Sadly tennis enthusiasts, the time has come to bid adieu to the 2007 season, but fear not, the hiatus will be brief. Soon enough, the courts will be ablaze with the shrilling grunts of Maria Sharapova, the artistry of Roger Federer and the mercurial ever-flamboyant fashions of Serena and Venus Williams. Prior to foretelling what 2008 may unwrap, let’s take a moment to reflect on the marquee events which shaped tennis this past year. On the women’s side, Serena Williams started 2007 in grand fashion by winning the calendar’s first major. Serena, who had been sidelined for most of 2006 by a myriad of injuries, was unseated when the 2007 Australian Open started; consequently, she was the dark horse of the tournament. Serena not only reached the finals, but also comprehensively beat a befuddled Sharapova. Who can forget Oracene Williams’s advice to her daughter “ get out of Melbourne”, referring to the painted sign on the court where Serena had been camping out, pushing her too far off the baseline. Well, Serena followed her mother’s pointer and got out of Melbourne, but not before snatching the coveted Daphne Akhurst Memorial Cup. At another prestigious venue, the Ericsson Open, Serena again demonstrated her tenacity coming back from a bagel lost in the first set and fought off two championship points by her opponent to win the tournament against a relentless foe in Justine Henin. Although the year started out with a sizzle, it would end with a fizzle with Serena losing consecutive quarterfinal matches against Henin at each subsequent major tournament. Once more, Serena’s last few months on tour were racked by injuries leading to her withdraw from the season ending tournament in Spain. After a tumultuous start to her year, with the turmoil in her personal life (the dissolution her marriage) and being forced to skip the Australian Open where she had been a finalist in 2006, Justine Henin had undisputedly her best season on tour. Henin won 10 of 11 finals including her third straight French Open while participating in only 14 events. The sign that Henin is human came at Wimbledon where she lost to a French player in the semifinals, not Amelie Mauresmo, but relatively unknown, Marion Bartoli, whom Venus Williams summarily defeated in the next round to claim the Venus Rosewater dish. Therefore, as Rafa Nadal seems to be Federer’s handicap on the clay in Paris, in 2008, it will be interesting to see if the All England grass and the French women continue to be Henin’s kryptonite. In a run reminiscent of 2005, Venus worked out the rust in her game to make Wimbledon the highlight of her year. Fit and focused, Venus showed the brilliance that can illuminate her game toppling three top ranked opponents to capture the cup with her namesake. Venus continued to excel the remainder of the season although she had to cede her place at the season ending championship tournament to Sharapova because of illness. The Russian diva took full advantage of the gift by making it to the finals in Madrid where she gave Henin a run for the money prior to falling in a thrilling three setter rescuing a par year plagued by a sleuth of health problems. Thus, it remains to be seen whether in 2008 the Siberian ice queen’s game will continue to heat up or will need to be rescued from the frozen tundra once more. 2007 will be remembered as the year which propelled a small nation called Serbia into the tennis spotlight and one woman in particular Ana Ivanovic. The teenage phenom heralded her arrival with her phenomenal play at the French Open culminating with an appearance in the finals prior to collapsing under the weight of the occasion by losing to Henin. With a blistering forehand, Ivanovic will definitely be a force to be reckoned with in the upcoming season; the question that will need to be answered is whether fellow countrywoman Jelena Jankovic will also be a factor. A woman’s right to choose saw the exit of a champion and return of another for contrasting reasons. Kim Clijsters decided that after winning one major trophy, she had her fill. For Kim, it was time to move on to marriage and children. While Lindsay Davenport returned to the court after the birth of her son hoping that there is still life in her career. Moreover, the 2007 sports season will be recalled as the year marred by drugs from steroids use in baseball to the career-ending shocker whereby Martina Hingis abruptly retired disputing the outcome of positive cocaine on a drug screen at Wimbledon. Since this is a locally slanted outlet, I would be remised if I did not mention Ahsha Rolle and her exceptional performance at the U.S. Open. After earning a spot as a wildcard, the 109 ranked Rolle became the buzz of the tournament after her opening round victory over the 17 seeded and talented star Tatiana Golovin. The bee from Miami would have the best showing of her career to date in a major making it to the third round where she was ousted by Danira Safina. I was fortunate enough to attend one of Ahsha’s matches, in my opinion, a major weakness in her game is her one-dimensional backhand; she constantly slices it back. If Rolle is to have continued success on the circuit, she will need to develop more sting and variety to her backhand. Considering the horde of new comers who impacted the game in 2007 and with so many youngsters doing particularly well at the final major of the year defeating experienced players to make it past the fourth round, the upcoming season promises to be gripping. In my viewpoint, the newcomer to watch will be Agnes Szavay from Hungary. Szavay looked impressive on the hardcourt making it to the quarterfinals at the U.S. Open after being a finalist the previous week in New Haven where she was forced to retire against the #1 seed Svetlana Kuznetsova due to a back injury. With the surface change in Australia to reflect more of a hardcourt feel, I predict that she will be poised for another great run there. Overall, the young guns from the Soviet Union and the former Eastern Block look ready to make an even greater mark on the game this coming year. On the other hand, Henin appears to have taken a liking to the #1 spot; therefore, everyone will be vying to dethrone her. At times, the psychological part of her game has proven to be her weakness, thus, along with skill, mental fortitude will be the key to the opponent’s ability to dismantle her game. A player who does possess these weapons in her arsenal is Lindsay Davenport; I anticipate that with her return Henin and the Williams sisters will be breathing a little tighter.